The equipment was at rest when this shot was taken Tuesday afternoon. 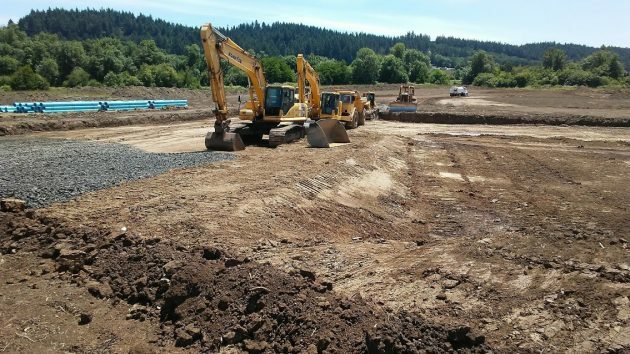 If you drive along Ryals Avenue in Benton County, the construction you see south of the road is the result of the desire by the city of Adair Village to be more than a tiny bedroom community. It wants to be a bigger town. Somebody asked me what the construction there was all about, and on Tuesday I asked Pat Hare, the city administrator. 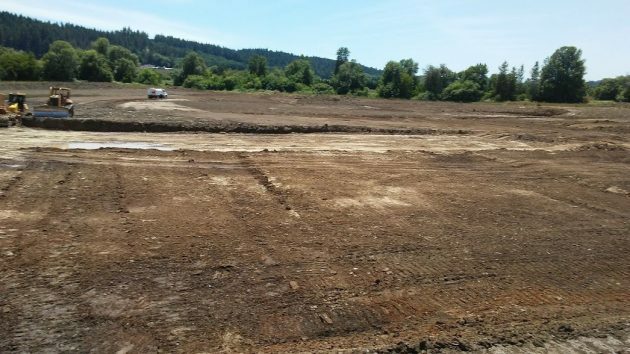 It’s the start of a single-family housing development by the Cornerstone company, based in the Portland area. Last September, the city government approved the “Calloway Creek planned development subdivision” on 41 acres south of Ryals Avenue and east of Highway 99W. The development calls for 198 houses there, to be built in four phases. The first phase, for which the streets and utilities are being put in now, will have 59 houses. Adair has a population of about 900. Hare told me this is not the only subdivision in the works, and the town could grow close to 3,000 over the next decade or so. Some years ago, Adair annexed land so many more people could live there. One plan, for a 500-lot subdivision, fell through because of the recession. But now building has resumed. The town wants to get more stores and services than the handful it has. And for that to happen, it needs more people first. Looking across the former field where the Calloway Creek development is going in. Wow, more housing. I was thinking it might have been an industrial type of build. Thank you for reporting on this! “Good luck with your commute,” indeed. Well, the city manager’s last name is Hare. The next thing we read will be that Adair is forming an urban renewal agency! Nobody? Corvallis is extending NW Circle Blvd. west/south from a little beyond Witham Hill Dr. all the way to Harrison Blvd. Earth-moving equipment was chugging away today. This may be part of a deal for new student housing near Harrison and/or part of a long-time plan, I don’t remember the details. Traffic will get a little worse. People here will complain, not realizing how good we have it compared with almost everywhere else, and unwilling to do anything differently from what we’ve always done (build more roads).